A corner of paradise, to live an unforgettable experience among the scents of the sea and the Mediterranean maquis. The charming villa directly on Palinuro beach is characteristic for its sand dunes and the lavers of collection that a time holding in itself the salt from sea storms. 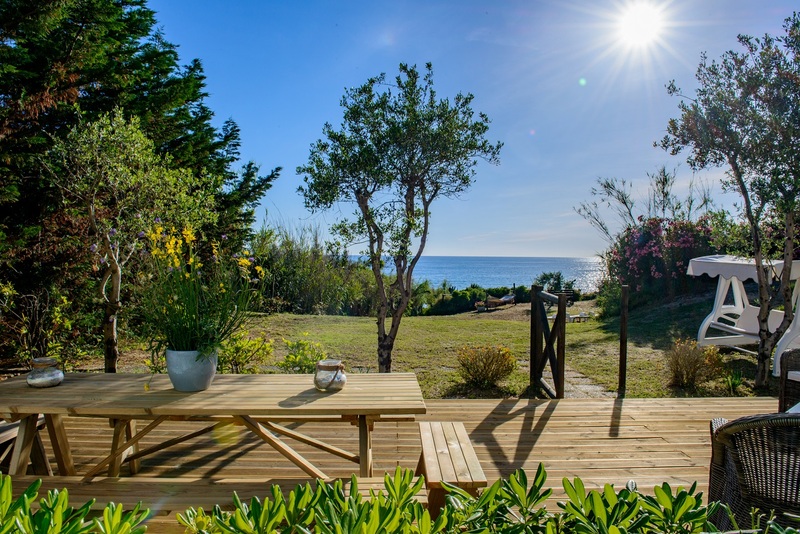 Saline villa enjoys direct access to the sea, surrounded by a verdant and large garden equipped with a hammock and a barbecue area, ideal for those who like to relax in the open air with the only noise of the sea and nature. All the streets of access are in beaten earth sandy and not paved is therefore recommended a car high 4WD. The surrounding area is characterised by Mediterranean maquis. Once in the villa, the blue of the sea is reflected in the furnishings that characterizes this unique solution ideal for a family of 4 adults and 2 children. Setting the large living room with sofa covered with soft pillows can be glimpsed the sea. It will be a pleasure to have meals with a wonderful view on the blue sea. The fully equipped kitchen is equipped with oven, refrigerator and dishwasher. The refined majolica blue on the kitchenette reflect the rays of the sun illuminating the environment. To enjoy a relaxing afternoon rest and especially to recharge your batteries after a beautiful day by the sea, in the villa there are two bedrooms with double bed. One of the rooms is also equipped with a single bed to give the possibility to check also the rest of a child. A third room with single bed is ideal to accommodate the rest of a child on holiday with the family. The villa has two bathrooms equipped with shower and washing machine. The villa is located directly on the beach of the salt pans which can be accessed from the garden. You can enjoy the view of the sea even from the lovely veranda with wood flooring parquet whose color is attuned to green nature of Mediterranean maquis that surrounds the villa. An atmosphere of peace reigns in the garden where on the hammock or rocking on you a relaxing sunbathing. At sunset the sun gives performances unique diving in the sea and staining the sky and sea of a thousand shades. From the veranda you can admire the enchanting view of Capo Palinuro with the lighthouse which illuminates the waters of the sea during the dark starry nights. To preserve peace and calm, Villa Saline is located a few minutes by car from Palinuro. Along the road to reach the center meet bar and restaurants. At the restaurant La Brigantessa you can enjoy delicious dishes of the culinary tradition of Cilento prepared with high quality products.